I have lots of food memories. One special memory involved pizza. Back in Yonkers, New York, where I spent my early childhood days, we visited a little pizzeria that made some pretty darn good pizza. I suppose we were regulars, as the guy remembered us when we came in. I think he thought I was cute--little girl with a big smile, curly pig tails, holding her daddy's hand. In chatting with us, he came to realize I loved cheese. So he often offered me some graded mozzarella to snack on while we waited. And then, one fine evening, he gave my dad a bag of pizza dough. "Tell your wife to fry them in oil and then toss them with powdered sugar. Your girls are sure to love 'em." He called them "Zeppoles." I called them love. And since then, I've always looked for a good excuse--er, reason--to make them. Rosh Hashanah is the Jewish New Year. As with most Jewish holidays, our customs and traditions revolve around food. Symbolism includes sweet things (ie, wishing each other a sweet new year) and round things (ie, symbolic of the how time evolves and we have come back to the beginning of the year). At the most basic level, we dip apples (which are symbols of the harvest and are round fruit) into honey (for the sweetness). It's your basic easy dessert recipe. This year I was looking to try something new and different using the traditional tastes and flavors and then hit me--Apple Zeppoles!! These treats are light, crispy, chewy, sweet and round. All I had to do was marry the pizza dough flavors with apples and honey. I took some elements from various pizza dough recipes and added my special New Year's touch to make these divine dessert noshes! * I used an apple-white grape juice blend, since that's what I had in the house. In a small mixing bowl, mix together 1/4 cup of apple juice with the honey. Add yeast and mix to combine. Let sit for about 5 minutes to proof. Add flour and salt into the bowl of a mixer, and mix together with a fork. Add yeast-juice-honey mixture, remaining juice, water, and olive oil. Using the dough hook, turn on mixer and combine ingredients. After it just comes together, add the grated apple and continue mixing for another 3 to 5 minutes, to ensure all the ingredients have been incorporated. In the meantime, heat about 1 1/2 inches of oil in small pan over high heat. Break off about 1 inch pieces of dough and them add to hot oil, being careful not to overcrowd the pan. Let them cook on one side for 3 to 5 minutes, until barely golden (gold-kissed). Turn with tongs and let cook another 3 or so minutes for the other side to get almost golden. 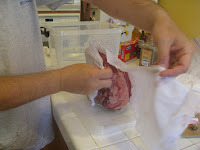 Remove with tongs to paper bag and throw in powder sugar. Close bag with your hand and shake to distribute the sugary goodness over your fried dough. Remove from bag and serve warm. Kids like 'em with milk. I like them with a nice glass of red wine! Growing up, there was always one thing you could depend on during a Jewish holiday feast at our house--brisket. Mom's brisket was always good. It was a recipe she received from my Grandma, and probably one of those family recipes shared along the lines. So when I moved out and had my own family, of course, I began cooking the family brisket recipe. But was it really as good as it good could be? A man happened to be home one day when his wife was preparing an old family recipe. In fact, it was one of his favorites, so he watched her carefully. He paid attention as she lovingly attend to the roast, trimming off excess fat, sprinkling and rubbing on the spices. And then *WHACK*. She hacked off a huge chunk of meat. Astonished, the man turned to his wife and asked, "Honey, I am totally fascinated with how you are making my favorite roast, but I have got to ask: Why did you just whack off such a large piece of meat?" The woman shrugged and answered, "I'm not really sure why it's done, only that it's always been done this way. It's the family recipe. That's how mom always did it, so that's how I do it." About a week later, the man was invited to his mother-in-law's house, where she was planning on serving the famous family roast. The husband arranged to arrive early, telling his mother-in-law that he was eager to see how she made his favorite meal. Just like his wife had done, the mother-in-law lovingly attended to the roast, trimming off the fat, applying the spices and then... *WHACK*! The man turned to his mother-in-law. "Mom, you know I absolutely love this roast, and I am so curious as to how you prepare it. 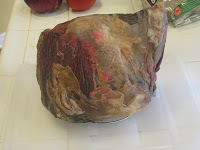 Tell me, why is it that you chop off a large piece of meat? Does it do something to the flavors? Is it a tenderizing procedure? Did you find a piece of meat that just wasn't good?" The woman shrugged and then replied, "That's how my mamma did it, it's tradition. So that's how I do it." Time passed, and the man watched over and over again as his wife and her mother chopped off and discarded a large piece of meat from the roast. Puzzled, the man decided to call his wife's grandmother. "Grandma, you know I love the family roast. I have been studying how it's prepared by watching your granddaughter and daughter cook. And I have to tell you, and I am little confused about one of the steps. After seasoning the meat, they both cut off a big ol' piece of meat. Mom said that's the way you always did it, and she wants her roast to be as good as yours. So although she isn't sure as to why it's done that way, she has continued with the traditional recipe. "So, tell me, Grandma, why is this done? Does it add some flavor? 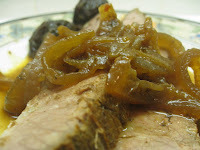 Change the tenderness of the roast? I'm sooo curious!" The grandmother laughed. "Well, there really is a good reason. I had a rather small roasting pan back in the day, and the meat wouldn't fit into it. So after trimming the fat and seasoning the roast, I always had to cut of a chunk of meat to make it fit into the pan." Mom's brisket recipe was fairly simple, and in a pinch, it's good (enough). Rub brisket with onion soup mix. Place in roasting pan. Put carrots, prunes and potatoes around brisket. Sprinkle potatoes with paprika and garlic powder. Add enough water so that there's about 1/2 inch to inch of water in the pan. Cooking time was--and I quote--"Cook the daylights out of it." More specifically, Mom noted it should take about 4 to 5 hours. As time passed, I started noticing other flavors in some Jewish briskets. Some were very sweet and had hints of ketchup. So had more onion and herb flavors. Some were even a tad spicy. Various flavors and subtleties... As opposed to mine, which was...... good enough. And good enough just didn't seem good enough any more. So, I played with the flavors until I came up with a new and improved brisket recipe. Rub spices evenly across all sides of the beef. 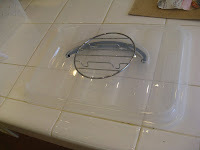 Heat roasting pan over high heat on stove burners. Add beef and sear on all sides. Remove pan from heat. Pour in beef stock, red wine. Add enough water so the liquid level is about 1 inch deep. Scatter one onion's worth of onions around the pan. Scatter carrots and prunes. Add brown sugar. Cover with aluminum foil, and put roasting pan in oven. As brisket begins to cook, add oil to a large saute pan and then add remaining onions, cooking over medium heat to carmelize. This should take about 40 minutes. After the roast has been in the oven for about an hour, add the carmelized onions and smashed garlic to the liquid. Stir and taste for seasonings (salt, pepper). Keep covered and cook another 3 to 4 hours, or until the meat is fork tender. Let meat rest about 20 minutes before serving. 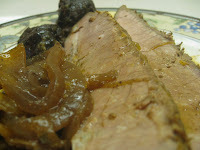 Serve pan gravy, onions, carrots, prunes alongside the meat. Preferably eat with a big ol' piece of fresh challah! 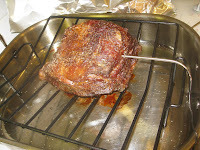 One of the best splurge meals that is accessible to the average Joe is the prime rib roast. Unfortunately, for many people, the term is a bit of an oxymoron--if you're not getting a prime cut of meat, then it's not prime, girls and boys. Does Your Beef Make the Grade? Over the years, we've learned why a cut of beef that is fantastic melt-in-your-mouth magic at a restaurant is just "eh" at home. It's all to do with the grade of beef. Want your beef to get an A+ for taste? Then you need to understand the USDA's grades. Generally, you'll find Select cuts at the local megamart. Some specialty shops claim to have better cuts, but usually they only offer choice. Bless Costco's heart... they often put out beautiful pieces of prime. Sure, it costs more, but it is soooo worth it. And, if you keep your eye out for it, you'll find Costco often offers prime cuts for the same price as the select cuts found at the supermarket. You've heard the phrase at all the fancy shmancy restaurants -- "we age our beef". Why is aging such a big deal? With time, the meat breaks down a bit and becomes more tender. As it ages, it can also gain flavor as moisture is lost and the flavors concentrate. And who doesn't love tender meatiness? There are two ways to age beef--wet and dry. In wet aging, the meat is vacuum packed in plastic and left in a controlled refrigerated environment for up to four weeks. Unfortunately, since the moisture has no place to go, wet-aged beef gains in tenderness but not so much in flavor. Even more unfortunate, because it is an easier and cheaper solution, it has become an industry standard for aged beef, with as much as 90% of the beef aged in this manner. And then there's dry aged beef--the gold standard, the nirvana. It requires more care and more space than its cryopaked brethren, and there's more shrinkage (Yes, George Constanza--there is shrinkage!) due to the loss of excess moisture, but boy is it worth it! Happily, dry-aging can be done in the comfort of your own home. In fact, some of your favorite Food Network pals, namely Guy Fieri and Alton Brown, have shared their know-how on dry aging. 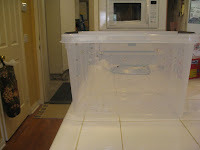 - Large plastic storage container: The container should be large enough to hold the roast with lots of breathing room. We picked up a set of these handy-dandy containers at Costco; some went to toy storage, one went to meat storage. - Small wire rack: The rack needs to be able to sit comfortably in the container; we used a steamer metal rack. The rack allows air to circulate around the bottom of the roast. 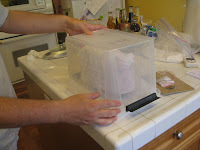 Your meat will need to breathe while it ages, so the first thing you need to do is drill holes in the plastic container. Next, make sure your rack will sit flat and firm on the lid of the container, which will serve as the bottom of your meat-aging contraption. (It's a lot easier to lift the box off the lid than lift the meat out of the box.) Our little rack has four "legs," so we made slits in the lid to snugly fit the legs. Now, dry your roast with some paper towels and place on the rack. It's time to mummify your delicious piece o'meat. 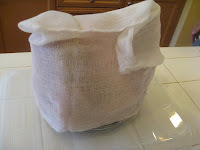 Take out your cheesecloth, and gently drape (you don't want a super-tight fit) it around the roast. Make sure it's covered on the top, sides and bottom. Triple wrapping is recommended. And then you can put the holey base of the container over the meat. As time goes on and the beef loses it excess moisture, the roast will shrink in size (and weight) and start turning a darker brown color. The meat might also have a mature smell to it. If it has a very strong stank to it, or it has green on it, then you might have had a problem with keeping it sufficiently dry or cold. In such cases, proceed with extreme caution (and at your own risk). This is what our love looked like after she spent some time chillin' and dryin'. Hungry yet? Let's cook this thing! * This is the final weight after aging. Don't use the weight of the roast when you bought it! When planning, you will want to allow for an additional 60 minutes of pre- and postresting. About 30 minutes before cooking is to begin, remove the roast from the refrigerator so it can come to room temperature and preheat your oven to 450º F.
Season the roast generously with salt and pepper. 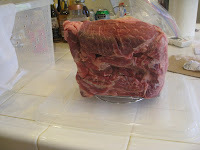 (If you like other seasonings on your prime rib roast, go for it. You can even insert slivers of garlic if you'd like.) Place the meat on a rack in a roasting pan, and then put it in the oven. After 30 minutes of cooking, lower the temperature to 350º F and continue cooking for the rest of the time that you calculated. So, if you want to eat at 7:00 pm, you'll want to take the roast out of the refrigerator at 4:35 pm. At 5:05, the roast should go into the oven at 450ºF. At 5:35, you'll lower the oven temp to 350º F and continue cooking for another 55 minutes. At 6:30, the roast will come out of the oven to rest for another 30 minutes. And at 7:00 pm, ring that dinner bill! Yeah, you could just sit down like a caveman and tear at your luscious roast beast, but it's much nicer (and more civilized) to serve some sides with it. No need to get complicated or fancy; sometimes simple is perfection. Go easy on the flavors in your sides, as you don't want to overpower the flavors of the roast. Breads. Yorkshire pudding (which is a more of a tender roll/biscuit than a pudding) is a traditional favorite, but I find it to be a big ol' hassle. A fresh, hot loaf of French bread and some butter works just as well. (Better yet--skip the butter and dip the bread into the pan drippings. Oh.Yeah.Baby!) Like it sweet? Try some Hawaiian rolls. Veggies. Roasted broccoli or cauliflower stand up to the meat without overpowering, and both are very easy to do. When you take the meat out of the oven, bump the temp back to 400º F - 425º F. Place veggie stalks on baking pan, drizzle with olive oil, sprinkle with salt and pepper, and roast for about 15 minutes or to your desire tenderness. Sauteed veggies also make great sides. Green beans sauteed in olive oil and sprinkled with salt and pepper put green and freshness on your plate. Better yet, scoop up some of the oily pan drippings from the beef and saute the green beans in that. Delish! Sauteed spinach is also an easy and flavorful option. Grab a few bags of prewashed spinach, toss a kiss of olive oil in pan, throw in the spinach, and let wilt to deliciousness. Towards the end of cooking, add some salt and crushed/minced garlic. Like to hide those veggies in some cheese? Try broccoli gratin. There are many good recipes out there. I prefer the one in Joy of Cooking. Essentially, you make a cheddar cheese, toss in some broccoli and bake. Potatoes. Meat and potatoes is a marriage made in culinary heaven, right? Try Emeril's rich and decadent Garlic Mashed Yukon Potatoes. More of a gratin fan? You can't go wrong with bacon, cheese and potatoes in Tyler's Ultimate Potato Gratin. It's a bit of work, but well worth it. Want to keep it simple? Baked potatoes are a classic addition to any meat meal. Put all sorts of toppings in little bowls and let your guests serve themselves. Cheesiness. We're huge fans of cheesy goodness, and a little cheese with the meat can be a very good thing. In fact, it can add to the comfort food factor. Consider serving a broccoli gratin (see above) or a freshly baked macaroni and cheese. Bon Appetit! or: Let The Feasting Begin! Once the meal is ready, it's time to eat. Gather your guests, pour the wine (or other favorite beverage) and enjoy your labor of love. Just be warned--fine food cooked at home can become addictive!